Test Tube Aliens – Teach Your Kids About Responsibility And Government Cover-ups | OhGizmo! By Andrew Liszewski on 03/21/07 • Leave a comment! Has your kid been bugging you for a puppy or kitten but you’re just not sure if they’re responsible enough? Well what better way to find out then by having them care for a Test Tube Alien? 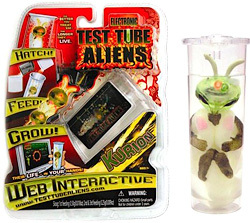 The story behind this bizarre toy is that an invasion from another world is well under way and your child can help out the invaders by adopting and raising one of the aliens in a test tube. So in addition to responsibility I guess they also get to learn about treason by helping the enemy. The aliens start out as a white egg crammed in a plastic test tube that magically hatches (dissolves) once you fill it with water. You then add a packet of powdered ‘food’ and watch as the alien grows over the course of a week or so. To keep track of how the invader’s doing it has a flashing light on its head indicating its heartbeat. Your child will need to make sure the alien has the right level of liquid in the tube and equal amounts of darkness and sunlight to keep the heartbeat going at a steady pace. For a more thorough diagnosis you can even log into a special website which can communicate with the tube letting you know just how terrible a guardian your child has been. The Test Tube Aliens can be found on Amazon for $14.99.